A third live-action Scooby-Doo movie, based on the popular cartoon canine and his friends of Mystery Inc., kicked off principal photography today in Vancouver. Though the characters will still be recognizable to fans of the animated series, there are a few changes in store. Scooby-Doo Where Are You! debuted back on September 13, 1969 on CBS. The series follows the animated adventures of four teenage kids and their big dog as they tried to solve spooky mysteries. Though it would initially appear like there were supernatural forces at work, the culprit would usually turn out to be an ordinary person who, using makeup or special effects, was trying to commit a crime of some kind. The series lasted for 25 episodes but became an hour-long show that included celebrity guest stars. The characters have proved so popular that they’ve returned in almost a dozen series and several animated TV movies. In 2002, Scooby and his meddling friends made the move to the big screen in a live-action movie. The picture stars Freddie Prinze Jr. (Fred), Sarah Michelle Gellar (Daphne), Linda Cardellini (Velma), Matthew Lillard (Shaggy), and Neil Fanning (voicing the CGI canine). The movie earned $276 million worldwide, enough to spawn a sequel in 2004 with the same cast. The sequel brought in $181 million globally. Now a third movie, one will head straight to TV and a direct-to-DVD release, is being produced but with a new cast. 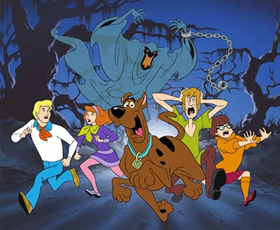 Scooby-Doo: In the Beginning is set prior to the events of the other feature films. Beginning will tell the tale of the friends’ first adventure together, solving the mystery of a haunted high school. The fresh faces of Mystery Inc. include Rob Amell (Fred), Kaitlyn Melton (Daphne), Hayley Alcroft (Velma), and Nick Palatas (Shaggy). Frank Welker will supply the voice of the computer-generated Scooby-Doo. Welker’s been the voice of the animated Fred since the beginning and took over as the voice of the animated Scooby in 2002 (following the death of voice legend Don Messick). Brian Levant is directing the picture with a script written by brothers Daniel and Steven Altiere. Brian Gilbert is the movie’s producer. The new Scooby-Doo movie will debut on Cartoon Network as part of the channel’s push to create new movies and live-action projects. Cartoon Network currently airs past incarnations of the Scooby-Doo series. The new movie’s expected to debut in Fall 2009. Stay tuned!